In the three years since Microsoft made C# available, there have been lots of tweaks to the language. That's because C# is not only essential for making .NET work, it's a big way for Microsoft to attract millions of Java, C and C++ developers to the platform. And C# has definitely made some inroads. Because of its popularity among developers, the language received standardization from ECMA International, making it possible to port C# applications to other platforms. To bolster its appeal, C# 2.0 has undergone some key changes as part of Visual Studio 2005 that will make development with .NET quicker and easier. That's precisely what Visual C# 2005: A Developer's Notebook allows you to do. There are some great new features in C# and this unique "all lab, no lecture" guide covers them all with 50 hands-on projects. Each project explores a new feature, with emphasis on changes that increase productivity, simplify programming tasks, and add functionality to applications. C#'s component-based design combines the productivity of Microsoft's popular Visual Basic with the raw power of C++ for web-based applications. Many reviewers note a similarity between C# and Java–in fact, a new feature that took the Java development team five years to incorporate into Java is now available in C# 2.0. Called "generics", this feature enables developers to reuse and customize their existing code, so they can dramatically cut down the time it takes to develop new applications. 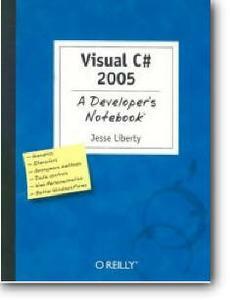 Visual C# 2005: A Developer's Notebook is full of no-nonsense code without the usual page-filling commentary. You'll find suggestions for further experimentation, links to on-line documentation, plus practical notes and warnings. The book also tells developers how to acquire, install and configure Visual Studio 2005. Are you a coder to the core? Learn what C# 2.0 can do for you now.